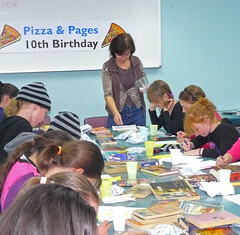 This year is the tenth anniversary of Pizza & Pages, where our young adult readers get to munch their way through some yummy pizza while they find out about great new books at the library. 20 keen readers enjoyed tasty pizza generously donated by Taglia La Pizza (corner Glencoe St and Stapleton Ave, Sutherland). Books featured on the night included Being Bee by Catherine Bateson and Don’t call me Ishmael by Gerard Michael Bauer. These books are both nominees for 2007 Children’s Book Week awards. Other books presented were In the Nick of Time by Robert Swindells, Singing for Mrs Pettigrew by Michael Morpurgo and I’m being Stalked by a Moonshadow by Doug Macleod. Our next Pizza & Pages night will be held at Sutherland Library in term 4. Keep your eye on our events calendar for the date. Do you know what happened on your Birthday?